International cotton prices fluctuated within a range of a few cents during February, but closed the period higher on balance. The Cotlook A index opened at 84.25 US cents per lb, close to its low point for the month of 84.10 cents per lb, before firming to reach a high point of 86.80 cents per lb, mid-month. The huge volume of mill fixations which remained to be made as March’s First Notice Day (February 22) approached was a supportive market factor for most of the period. During a timely dip in prices shortly before that date, many spinners took the opportunity to either fix their positions or roll positions forward into the May contract. The July/December spread, which at the time of our last review was over 400 cent points (July premium), had narrowed by the end of February to just over 300 cent points. Mill buying was fairly limited early in the period, owing to high asking rates, but more active business was witnessed during New York’s decline. 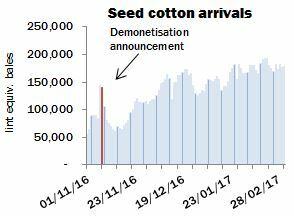 Underlying demand was evident in various markets, for a range of growths, though Indian cotton continued to be considered prohibitively expensive by most spinners, at a point in the season when that growth would usually be expected to attract steady buying interest. Supply-side issues encountered during and after the government’s ‘demonetisation’ policy, introduced in November, continued to be felt. Farmers were thought to be retaining stocks in an effort to maintain firm price levels, to the point that sporadic import demand was in evidence during the period. Some observers continued to question the eventual size of the crop, owing to a lower volume of cumulative arrivals than at the same point last season. However, daily arrivals maintained a good pace since their recovery following demonetisation and most observers attributed the lag between seasons to the slow release of stocks to market, rather than a major issue with the crop. West African cotton continued to attract demand but unsold stocks from that origin had for some time been depleted, with the result that nearby Franc Zone lots were increasingly difficult to source and commonly commanded a premium. Attention remained concentrated mainly on United States cotton, which maintained a competitive position in relation to competing growths on considerations both of price and nearby availability. 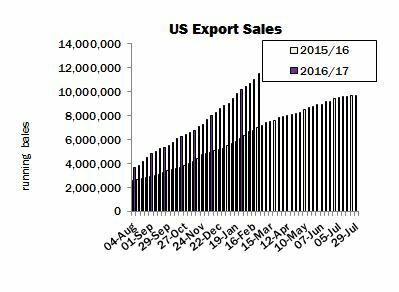 US export sales continued at a good pace throughout the month, and by the week ended February 16 cumulative sales stood at no less than 11 million running bales, over 4.3 million more than by the same point in 2016. The upward adjustment made to USDA’s figure for exports in the current season, which in February was revised to 12.7 million 480 lb bales, was therefore not unexpected. The potential remains for that number to be increased further, given that sales by the middle of February had already surpassed 85 percent of USDA’s revised estimate. The renewal of import from China in evidence after the turn of the year persisted during February, directed to a range of origins, including Australian and US (both current and new crop). Sentiment on the local market was increasingly influenced by the approaching start of this year’s State Reserve auction series, scheduled to begin on March 6. A vigorous start is anticipated by some observers, as mill buyers are believed to have purchased only their more pressing requirements in advance of the auctions’ commencement. The quality composition of the cotton to be made available via the auction series remained the subject of conjecture but the general consensus was that the tranche is expected to be composed primarily of lower grade cotton, and thus of particular interest to spinners of medium to lower counts of yarn. The impending auction of Chinese stocks focused attention once again on the outlook for Chinese and global stock levels and the longer-term price trend. China’s supply and demand statistics suggest that a major reduction in stocks will take place over the auction series (scheduled to run at least until the end of August), probably of similar proportions to the 2.6 million tonnes disposed of last year. If that came to pass, stocks would still be of daunting proportions (roughly six million tonnes), but a further significant step would have been taken towards the point at which Chinese stocks are considered ‘manageable’, though Beijing has not given any indication what that level might be. The reduction of China’s stocks is seen as the precondition of the country’s return as an importer from the international market of much larger quantities, a development that has bullish indications for world prices. In the meantime, however, next season’s likely supply and demand outlook is moving into sharper focus. February saw the release of Cotton Outlook’s initial tentative estimates of production and consumption in the 2017/18 season, though it should be noted that at this early stage all numbers remain subject to change over the coming months. World output is expected to increase by over one million tonnes, to 23,749,000, owing mainly to expectations of an increased planted area in India and Pakistan. This season’s firm prices in both countries have contributed to farmers’ enthusiasm for cotton. However, the crops in these origins account for the bulk of the increase in global production and are traditionally at the mercy of monsoon rains, and/or susceptible to pest attacks, as witnessed in recent seasons. Smaller adjustments were made to the figures for a number of other countries. In the US, the National Cotton Council’s planting intentions survey informed Cotlook’s assessment of output, which shows a moderate increase from the estimate for the current season. Modestly higher production is also anticipated in the African Franc Zone and Greece, while a moderate reduction is indicated for China (influenced by a return to average yields), among other origins. Cotlook’s initial estimate of global consumption, though exceptionally difficult to formulate at such an early juncture, implies a tentatively positive outlook, with an improvement of some 2.5 percent envisaged. A number of markets witnessed modest increases, including Bangladesh, China and Vietnam, mainly owing to increased investment in spinning capacity. 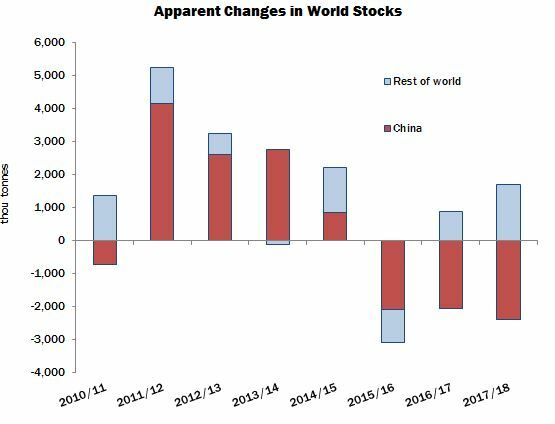 Global stock levels outside China are expected to increase by a further 1.7 million tonnes by the end of 2017/18, adding to a recovery of 885,000 estimated for the current season. The increase in the world outside China is expected to be more than offset, however, by a second consecutive, substantial reduction of stock levels in China, influenced by the aforementioned State Reserve auctions. World stocks are therefore expected to contract by 693,000 tonnes. However, given the potential for a considerable, further addition to stocks outside China, the forward statistical position at this early stage presents a rather bearish prospect.